If the polls are right, we could see a dramatic and historic shift in the allegiances of white voters on different sides of the educational divide in Tuesday’s election. The rise of Latino voters has also been one of the stories of this election, particularly in states like Florida and Nevada. The demographic shifts brought about the Clinton-Trump race have been clear in national polls for months now. With these numbers in hand, and with detailed demographic profiles of each of America’s 3,142 counties, we set out to build a county-level model for what the shift in voter preferences could look like once the counting is done tomorrow. 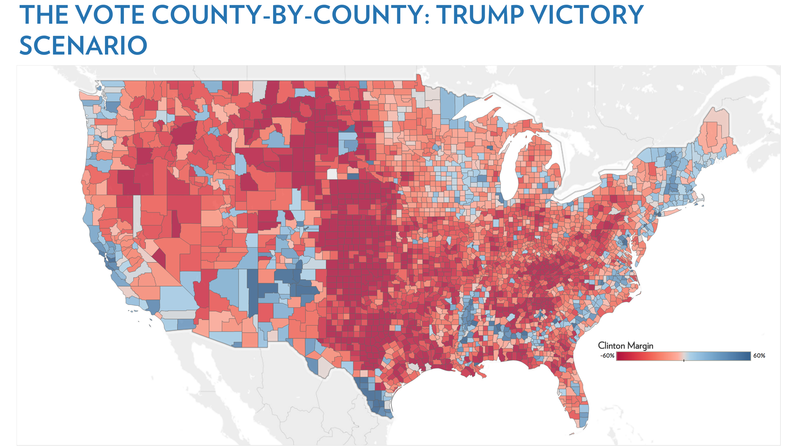 Here’s the map — with red counties showing where Donald Trump could be poised to improve on Republican performance from 2012, and blue counties showing where Hillary Clinton may improve on Democratic performance. The map is pegged to a scenario in which the national result — a Democratic win of 3.7 points — is the same as in 2012, an outcome pretty close to the outcome of the final national polls. We’re not making a projection on the overall outcome of the race, however, only on how different counties may change relative to 2012. 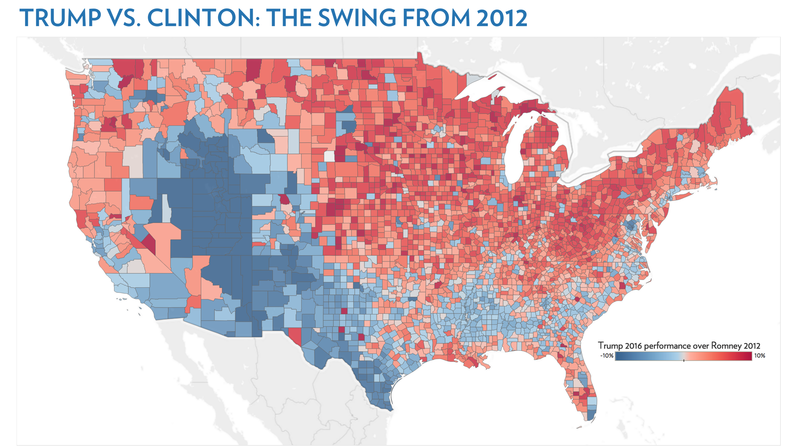 If Clinton were to improve her position from the final polls, there would be much more blue on this map — and vice versa. We’re using this data to generate a county-specific winning percentage for each candidate we’ll be using in our Election Night coverage (follow along here!). Driving the majority of the shift is the aforementioned divide of whites along educational lines. Counties with a large share of non-college educated white voters will be susceptible to a greater shift to Trump, and those with more college educated whites will likely be more in the blue column. In addition to whites-by-education, our projections on the relative shifts in Hispanic and African American support also reflect trends apparent in the public data. Yet, these aren’t the only divides to consider. Mormons look set to swing in dramatic fashion against Donald Trump. We project Trump could lose approximately 40 points of Romney’s 2012 margin from Mormon voters, enough for almost a one percent shift in margin in the national popular vote. Other groups that factor into the model are Evangelicals and ethnic whites, particularly in areas of the Northeast where Donald Trump might run stronger than past Republicans. 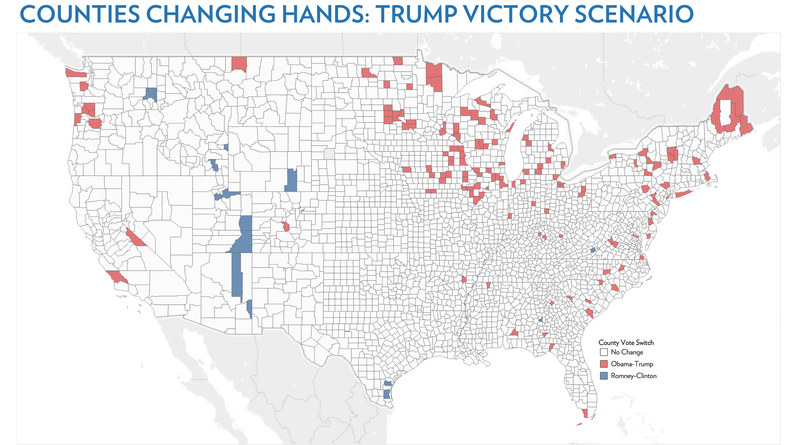 The map mirrors the shift we’ve seen in numerous states like Iowa, Maine, and Ohio which may swing their electoral votes in the Trump column. It also shows that Trump may feel powerful headwinds in Western state. This model is pessimistic that Trump can make a state like Nevada, with both Hispanic and Mormon populations, part of a winning 270 electoral vote coalition. The model doesn’t factor in local or regional factors, like ballot access, campaign effects in battlegrounds, home state support, or local issues that may override demographics. This may mean that we are a bit more conservative in the swing we show relative to public state polling. We’re often asked which “bellwether” counties we pay attention to know whether someone has won or lost. The short answer is: All of them. A vote in a “swing” county counts the same as the vote in a base county, and it’s often by racking up votes in a candidate’s most demographically favorable areas that elections are won. A model like this allows us to more quickly assess whether a candidate has over or underperformed on Election Night, and data from every county is helpful in making these assessments. Our model depends on having precise demographic estimates by race, ancestry, education, and religion at the county level. These statistics do not necessarily exist publicly, but every two years, the U.S. Census surveys Americans on their participation in national elections as part of the Current Population Study. These generate very reliable state-based demographic estimates which surpass the accuracy of exit polls. 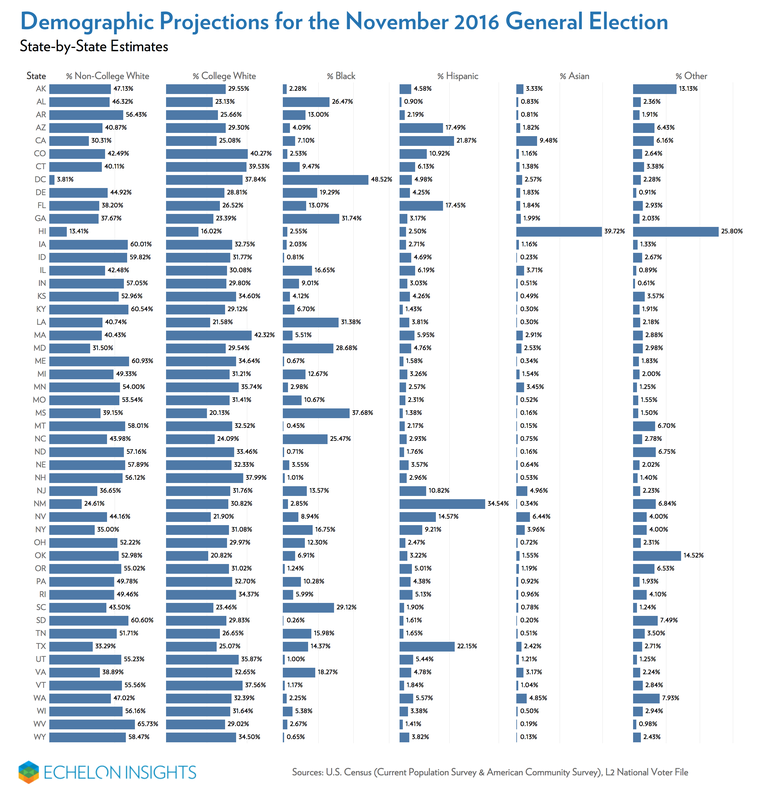 To project what the 2016 electorate might look like by county, we bring in other sources, including L2’s national voter file, education and ancestry data from the Census’s American Community Survey (adjusting them to reflect the electorate, rather than ) and county-level religion data from the U.S. Religion Census. Even with all this data, electorates don’t stay static from year to year. For example, the Latino electorate is growing between 1 and 1.5 points every Presidential election cycle. We project the total Latino share of the electorate at 9.8 percent in the 2016 (with 8.7% of these being Latino-only voters), a 1.4 point jump from 8.4 percent in 2012. The share of college-educated voters also creeps up every election. This election, our projection is for whites without a college degree to make up 43.1% of all voters and whites with a college degree making up 29.2%. When the Census releases data from the CPS’s Voting and Registration Supplement in the spring, we’ll see if we were right. Below is how we expect the electorate to break down by state — a handy reference for tomorrow night in case you were relying on exit polls to tell you the demographic breakdown of the electorate (we love exit polls, but we wouldn’t recommend it). Figures above reflect Census definitions of one racial group only, not in combination with any other group. Groups include non-Hispanic white-only, black-only, Hispanic-only, Asian-only, and other races, including those of more than one race. Polling/analytics. Digital ex. Co-Founder @EchelonInsights.